The von Buerens, Lotus Arts de Vivre’s founding family, are a venerable clan of travelers, collectors and creators— passions inherited by second-generation COOs and brothers Nicki and Sri, who continue to seek out exceptional materials and artisans over the world to help them creating their high-end jewellery, accessories and furniture designs. Every handcrafted object is an intricate meld of East Asian tradition, modern opulence and functionality. Nearly all their creations are one-of-a kind, and everything is completed in their Bangkok workshop. It’s all about balance. This is as true in design as it is skateboarding. 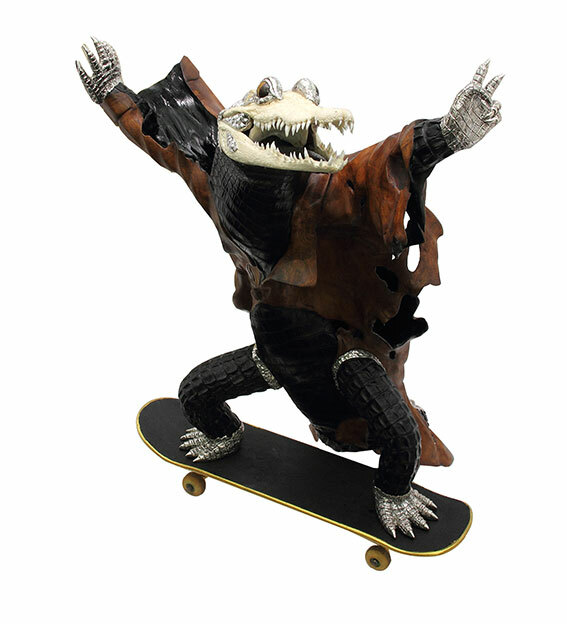 Hence, The Skateboard Crocodile is a testament to balance. It begins with the wood, its organic form wholly intact; the shape and scale of the wood piece will inform the final sculpture, not the other way around. This particular piece of Balinese iron wood was thought to resemble an open long-tail shirt billowing in the wind. But who then, or what, could fit in said shirt without any alterations? 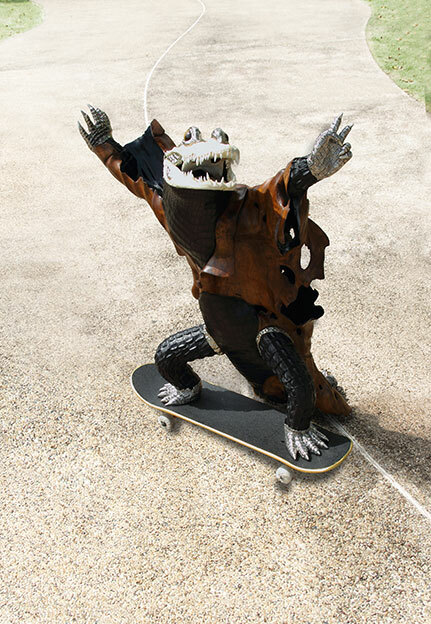 The crocodile stars prominently in the brand’s largely animal-themed repertoire—he has his own series—making him the natural choice. 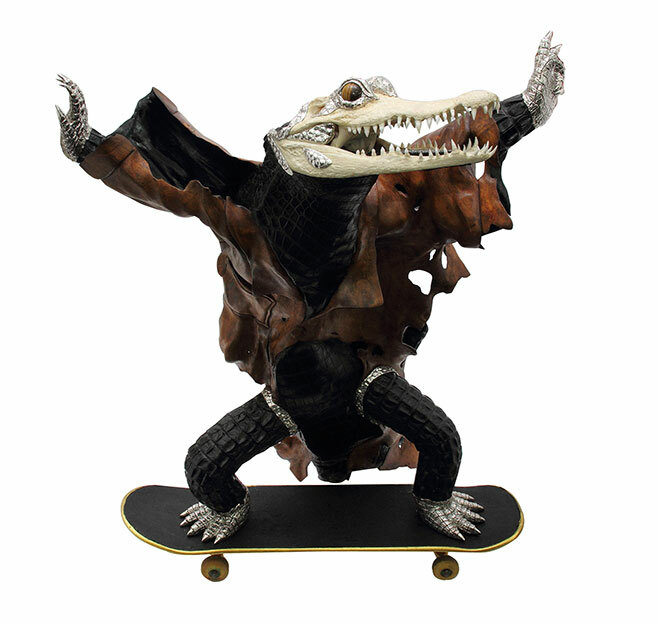 It took several months and several Thai craftsmen to slip the leather-clad body into the wooden garment (now complete with hand-carved buttons and pockets), and to affix to it a real crocodile skull and sterling silver claws, the front left one forming a “peace” sign. 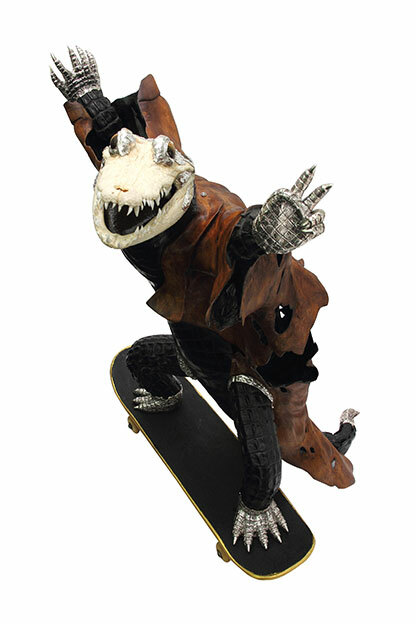 The crocodile was then carefully mounted onto a skateboard, donated by Sri’s son, in such a way that the entire sculpture could now move without damaging its tail. As for brakes? Well, that’s a different story.